This poll has some fun stuff in it. Check out the PowerPoint here. I’ll have more to say later. In the today's N&O, you'll find a report ranking our state's traffic among the nations worst. The report proves what we all know: traffic is terrible, and with the rapid growth, particularly in this area, we can only expect traffic to get worse. Conducted by UNC-Charlotte for a Libertarian think tank in Los Angeles, the poll encourages states to take action to ease traffic issues through "long-term investment in key corriders." But why not invest in mass transit alternatives? It makes sense to me. The New York Times released a poll today in collaboration with CBS News and MTV concerning young people ages 17-29 and their views on virtually every political issue. Full results can be found here. The poll found that young Americans are more liberal than the general public and more supportive of issues like universal health care and legalizing gay marriage. However, young people for some reason are more optimistic about the War in Iraq. Twenty-seven percent of young people think things in Iraq are going well, as opposed to 23% of all adults. Also, 51% of young people say that we are likely to succeed in Iraq, while only 45% of all adults feel that way. One upbeat result is that there is a continuing trend of young voters moving away from the Republican party and towards the Democratic party. Of those surveyed, 54% said they would vote for a Democrat in 2008, and 35% consider themselves Democrats compared to only 23% who consider themselves Republican. Another good sign is the increasing growth of the youth vote and the fact that more and more young people are paying attention to politics. According to the poll, 58% of young people are paying at least some attention to the 2008 Presidential election and 77% say that their vote will influence who is our next President. Also, 70% said that they are likely to vote in a Presidential primary next year. What all this says to me is that there is a growing trend among young Americans to become more politically informed and active. The fact that most young voters are drifting toward the left has to be exploited by the Democrats and used to their advantage. Barack Obama has done a great job doing this, as evidenced by his large name recognition among young voters. I just hope all those young people don't become more conservative as they grow older; it would be their loss. 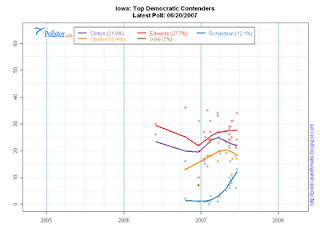 I found the chart to the right today on pollster.com that shows Bill Richardson's support growing substantially in Iowa. The writing is a little hard to read, but I'll tell you this: Richardson is the blue line on the bottom. Another poll by Fairbank, Maslin, Maullin and Associates poll confirms Richardson's gain in Iowa. Among likely caucus-goers, former Sen. John Edwards leads Sen. Hillary Clinton (34% to 24%) in a statewide caucus; Sen. Barack Obama trails at 17%, Richardson at 13%. Although Bill Richardson shows gains in Iowa and New Hampshire, he still trails the other major Democratic contenders significantly in the national primary polls. "As you may know, the U.S. Senate has been considering a bill to change the way the government handles the issue of illegal immigration. Based on what you have read or heard about all the proposals in the Senate immigration bill, do you favor or oppose that bill?" If oppose: "Do you oppose the Senate immigration bill MOSTLY because you think it goes too far toward helping illegal immigrants, or MOSTLY because it does not go far enough toward helping illegal immigrants?" Thirty percent of respondents favor the bill, while 28% say it goes too far and 15% say it doesn't go far enough. The 28% who say it goes too far are presumably conservatives who aren't happy with the citizenship measure. Conversely, the 15% who say it doesn't go far enough are most likely angry at the provision that gives preference to skills and education when admitting immigrants and limits immigration in general. As you can see, it doesn't have anywhere near widespread support, and 22% of people are still unsure as to what to think. Such a split across support, opposition, and indecision is not good when discussing a major change in immigration policy and how we should go forward in the long term. PPP released a poll today regarding the effect of the rising cost of gas on North Carolina's families and their driving habits, investigating who North Carolinians feel is responsible for the pain at the pump. 89% = percent of NC adults who are very concerned by the high gas costs. These last two numbers are what I find most interesting, 89% of folks are concerned by the high cost of gas (reasonably so) and 88% report a effort to drive less (great! ), but the majority of respondents will not even consider alternative transportation. One explanation for the low rate of use of alternative transportation is that our North Carolina communities are set up for driving. If North Carolina communities had better transportation options and pedestrian-friendly communities, more people would be willing to use alternative transportation. Currently, the options are so poor that although 89% of the public is very concerned by the cost of gas, over half of the respondents, 54%, polled will not even consider alternative transportation. The perception of current mass transit systems as inefficient, inadequate, and unsafe for travelers also decreases the use of alternative transportation. For more information as to whom North Carolinians feel is responsible for the high gas costs (hint: American oil companies and George Bush/ the War in Iraq) ....Enjoy! PollingReport has information about a new Newsweek presidential poll. They did a presidential matchup poll just like we did for NC, but nationwide. There's also individual results for the Democratic and Republican races. On the Democratic side, it seems as though Hillary Clinton is dominating the field, leading Obama 43% to 27%. John Edwards trails with only 14%. It's interesting that this poll doesn't include Al Gore, which is probably a realistic scenario. That might explain why Hillary has so much support. However, my problem with the poll is that only 422 Democrats were surveyed and the MoE is +/-7%. That's a pretty huge margin of error for a national poll done by a large magazine. Although its probably accurate, it still makes Hillary's huge lead suspect. One extremely strange fact that's easy to miss is that Michael Bloomberg was included in the Democratic field for whatever reason. Why he's in there and Al Gore isn't makes no sense to me. What's even more surprising though, is that he only received 1% support. Bloomberg was also included in the Republican field and only got 2% support. The low numbers make some sense because only registered Democrats and Republicans were included in the each party poll. The Republican poll includes Fred Thompson, and he has a good showing, coming in second with 19%. Rudy Giuliani still leads with 27%. McCain seems to continue his downward slide, with 15%, while Mitt Romney is the only other candidate in double digits with 12%. This poll surveyed even fewer people (only 324 Republicans) and the MoE is +/-8%, theoretically negating the lead that Giuliani has over Thompson and putting them in a statistical tie. This essentially makes the poll useless because the MoE is so high. There are a lot of results in the matchups part of the poll that I'll let you read for yourself. But, they did include Bloomberg as a third party candidate in some matchups, and he consistently got over 10%, which makes the fact that he only got 1% in the Democratic field even stranger. It looks like he steals votes from both party, but slightly more from Republicans. Whether or not that factors in to the election next year, we shall see. One last tidbit: The Democrats win every single matchup listed, with the top three Democrats going against the top four Republicans. However, while McCain and Giuliani's numbers have been steady in the mid to lower 40s for a few months, Romney has gained about 10 points since the tracking poll began in December. We released a new survey today concerning immigration, smoking, and gas prices. The complete survey and report is here, but here are the essentials. The only result that really surprised was the amount of support for admitting people based on skills. I thought people valued family more but I guess it speaks to our country's priorities: rewarding people based on their merit. When it comes to smoking, most people oppose it. Sixty-two and 58% of people said they support banning smoking in puplic places and college campuses, respectively. As evidenced by the recent energy bill passed in the Senate, people are supportive of mandating higher fuel economy standards for car makers. Sixty-six percent of the people in our poll supported it. However, people never like taxes, so the idea of a higher gas tax to encourage conservation is seemingly a dead end, with 75% opposition. Read the entire report and let us know your thoughts. Another Gallup poll shows the influence of a candidates past and previous position/s on Iraq as a major factor in respondents voting choice in the upcoming 2008 election. the recent downturn in Americans' mood." If you check out this graph from Gallup we see that the growing dissatifaction in the country from 2000- present follows pretty closely the growing concern over the Situation in Iraq. Not surprisingly, support for President Bush and Senator Dole was split along party lines. Independent support for Bush is only at 32%. Dole has very high marks among Republicans, but she is losing support among Independents, which is not a good sign for her upcoming reelection. Interestingly, disapproval for President Bush is equally dismal throughout every age group. About 60% of each group disapproves of Bush, regardless of party. His approval ratings continue to drop on a monthly basis, and if he keeps heading in the direction he is, especially on immigration, even his base will abandon him. Among women voters, Dole seems to have higher support than Hillary Clinton, which is surprising considering that Hillary is the Democrat. Her support among women isn't as high as expected considering the high number of female Democratic voters. Even though she garners more female support than any one of her male candidates, she never receives more than 50% of her support from women. Oddly, Dole has the highest approval among young voters. Dole's approval rating is more than 50% among voters between 18 and 45. In the Presidential matchups, Edwards and Obama have the most support among Independent voters. They receive more Independent support than any of their Republican rivals and more than Clinton. However, Clinton receives the highest portion of black support, even more than Obama. While Obama's support among blacks is around 70%, Clinton has support upwards of 75%. Her high support among blacks is likely due to her high name recognition and the fact that her husband is very highly supported in the black community. Where Clinton garners support among blacks, though, Obama and Edwards have high support from younger voters. Both Obama and Edwards have the highest percentage of support from young people, with well over 50% of voters between 18 and 29 support either candidate. Interestingly, Fred Thompson also has relatively high support among young voters. More voters between 18 and 29 support Thompson than Clinton, and against Edwards, Thompson has 47% support. Barack Obama has limited support throughout the state, only really having high support in the 919 area code (the Triangl), which is arguably the most Democratic area of the state. However, name recognition might be a problem since he is a freshman Senator and doesn't have very much support throughout the state. Anzalone Liszt (D). 5/22. No trend lines. Hayes continues to be hurt by the harsh political environment still facing national Republicans. A majority (57%) of voters believe the country is moving in the wrong direction, while only 21% believe it is moving in the right direction. A majority (56%) now believe we should not have gone to war, while 57% favor a plan to begin withdrawing troops from Iraq this year and having almost all the troops out by next year. Talking to last cycle's DCCC crowd, this race, more than any other, makes them kick themselves. They swear up and down that late polling in the race (two separate polls) showed Hayes with a comfortable double-digit lead over Kissell so they looked elsewhere for pickup opportunities. And while they found plenty of them (it was a bumper crop), Kissell came just 329 votes shy of victory -- the tightest race and most painful House loss of the cycle. Kissell ran easily the most innovative race of last cycle, and came close to this victory despite being outspent $2.4M to $781K. This cycle is a little different. The DCCC clearly has targeted this seat and will focus resources on it (though hopefully won't touch Kissell's innovative campaign team). On the other hand, Hayes can't laugh off his opponent and take it easy. He'll be taking this race seriously, which should make Kissell's task that much tougher. And now an update on BlueNC too. After attending the monthly Civitas Institute luncheon today downtown and listening to a room full of Republicans analyze a Civitas poll and bash Democratic ideals, I thought I'd respond. Most of the results themselves weren't very surprising. The questions about Elizabeth Dole and potential challengers to her Senate seat in 2008 seemed reasonable, as did the results. However, the fact that Dole's approval rating is below 50% and a potential mathcup between her and Brad Miller has her only receiving 46% support is not a good thing for Republicans. As Justing noted, even though she leads Miller by 15 points, having less than 50% support is not a good sign for an incumbent. Some of questions moreso than others seemed clearly slanted toward the right. The questions on immigration reform mentioned amnesty, a word that brings up very negative feelings on the subject. Its no surprise that when the recent Congressional bill was branded as amnesty, people showed overwhelming opposition to it. When discussing the results of the taxation questions, it was noted that the way in which the questions were framed and what the taxes would pay for was very important in how people responded. Obviously, people are relatively opposed to higher taxes no matter what the circumstance, but telling people that the taxes would pay for pork projects, tax breaks to businesses, and new state jobs will create an even more negative reaction. Telling people their taxes will go to pay for useless or unnecessary budget expenses is not a good way to prove that taxes are bad. The majority of people accept taxes because they know they go towards essential social services and improving our state. If people wanted no new taxes as much as this poll and the ideologues at the Civitas meeting suggest, then people would vote that way. But they don't, which is why the Democrats have a majority in the state legislature and not the Republicans. Aside from the poll, the overall perception I got from the meeting was that of desperate optimism over the direction in which the Republican party is moving. Many of the attendees were staunchly conservative and did little to hide their disdain over the Democratic leadership in Congress and North Carolina government. However, the facts don't lie. Bush's approval rating is the lowest it's ever been, people are fed up with the War, and the Democrats now control Congress and looking towards the White House. They year 1994 was repeatedly brought up. The nostalgia for that year as the rise of Republican dominance was apparent and it seems as if those who still have faith in the party are trying their best to recreate the environment of 1994. I don't think that's going to happen soon, especially with the President making policy mistake after mistake and further alienating his supporters. The more people associate President Bush with the Republican establishment, the worse it will get for the party. Complete results here. Surprisingly Clinton outperforms Obama in most of the match-ups. Giuliani is the strongest Republican followed by Fred Thompson. According to the latest poll from Civitas support for President Bush among Tar Heel voters continues to fall. Bush’s approval rating fell to 36%, his lowest rating ever in a Civitas poll. 57% disapprove of the President, including 42% who strongly disapprove. During the Civitas poll luncheon a consensus seemed to form that Bush is losing support among his Republican base, and that’s why his numbers continue to decline. One reason why is the recent immigration reform bill. A number of questions in the poll show that North Carolinians are very much against any form of perceived amnesty. The Civitas poll also tested Congressman Brad Miller against Senator Elizabeth Dole. In a Senate race match-up Dole leads 46% to 31%. During the discussion, Republican consultant Ballard Everett was quick to note that Dole was under 50%; not a good sign for an incumbent. The poll also found that most voters don’t know much, if anything, about Brad Miller. Miller had a favorable/unfavorable rating of 14/10, whit 38% with no opinion, and 38% unaware. Tomorrow PPP will be releasing the complete results of our latest North Carolina poll conducted last night. The poll will include approval ratings for President Bush and Senator Dole, as well as two new hypothetical match-ups between Senator Dole and Democrats Beverly Perdue and Richard Moore. The results also include 12 possible Presidential match-ups between Democrats Hillary Clinton, John Edwards and Barack Obama and Republicans Rudy Giuliani, John McCain, Mitt Romney and Fred Thompson. Here is a sneak peek at some of the results. Here is an update of our tracking poll graphs using only PPP data. Civitas' lastest results will be released tomorrow. I'll let WakePol explain our polling experiment. Earlier in June PPP released its own poll of the South Carolina Presidential Primaries. The results were unique. We were the first pollster to find Fred Thompson leading South Carolina Republican Primary and we were one of only a few pollsters to have Barack Obama leading the Democrats. Now a new Mason-Dixon poll of South Carolina confirms those results. Rural voters key to NC-11? Much has been made this week of a new poll showing support for Republicans slipping among rural voters. See here, here and here, with a release here, analysis here, and the full poll here. "At present, the Democrats enjoy a 46 – 44 percent margin in named trial heats. Most notably, looking only a districts that switched parties in 2006, the Democratic margin grows to 56 – 34 percent (e.g., Kansas 2, Iowa 2 and North Carolina 11). While the sample size here is fairly small, it appears it will be a severe challenge for Republicans to reclaim these seats." "...what I've heard so far is that Robin Hayes is in more trouble than he's ever been in and Larry Kissell hasn't lost momentum. From what I hear...on the uninformed poll question, the two candidates (Kissell v. Hayes) are neck and neck." Some links to people discussing the June NC Primary Tracking Poll. PPP’s polling in North Carolina, South Carolina and Iowa have had Fred Thompson in a much stronger position in the Republican Presidential Primary than other national and statewide polls had shown. We had Thompson leading in the Carolinas and a strong second in Iowa. But two new national surveys have now captured the Thompson surge. A Rasmussen Reports survey conducted June 4-7 has Thompson tied with the usual poll frontrunner Rudy Giuliani at 24%. And a LA Times/Bloomberg survey conducted June 7-10 has Thompson a strong second behind Giuliani (21%-27%). A recent survey by the News and Observer collected the opinions of 1000 Wake County residents on the quality of Wake County schools and how to fund them. Before we go into a discussion of some of the results and crosstabs it is important to note the methodology. This is a survey of Wake County residents, not likely voters and especially not likely voters for the upcoming municipal and school board elections. So while these results are interesting and important, they are not necessarily the best predictor of any future election outcomes. In the current whirlwind of the year-round schooling hubbub and calls for smarter growth, the results from the May 30th, 2007 poll reflect that not only do Wake county residents overwhelmingly oppose a possible school bond package (63% oppose it while only 26% support it), they also oppose new property and sales tax increases to pay for schools and do not think the Wake County School Board, County commissioners, or elected officials are handling the growth well. There seems to be a number of contradictions in the survey’s findings that are somewhat alarming. For example, although 57% of people rate the quality of Wake County Public Schools as excellent or good, only 23% said they favor raising property taxes “to pay for building more public schools and reduce crowding at Wake’s public schools.” It seems as if people want it both ways: they want to see the continued high quality of education provided to their children but they don’t want to pay for that service through property taxes that would help schools keep up with the massive growth. Also, a majority of people rate the School Board, county commissioners, and elected officials fair or poor when it comes to how well they are keeping up with growth. That rating seems strange considering that citizens are unwilling to pay the taxes that would help leaders keep up with the growth. One telling result that shows just how unpopular Wake County’s recent property tax increases have been is the fact that even 65% of Democrats surveyed are opposed to increasing property taxes to pay for schools. Although more Republicans, 77%, oppose a property tax increases, a rising trend of Democratic opposition does not bode well for future bond proposals. There are clear party differences when it comes to how Wake county residents view school performance. Sixty-five percent of Democrats who responded gave Wake County public schools a good or excellent rating, while only 53% of Republicans ranked Wake County schools as good or excellent. When asked whether they favor or oppose year-round schools, there were little differences between party responses. Age and income, however, affect opinion. Not surprisingly, respondents 65 years old and older show less opposition to year-round schools. Older citizens are more apt to support year-round schools because they do not have young children. However, when it comes to paying higher taxes to fund those schools, their opposition increases (at least 75% of people older than 50 oppose raising property taxes to support schools), showing another contradiction in the findings. Respondents with household incomes of $20,000 or less showed very strong opposition to higher taxes to year around schooling, with only 38% of respondents in favor. All other income ranges above $20,000 show at least 50% support, with several showing well over half of the respondents in favor of year-round schools. Some of the survey questions themselves may have affected the responses. The question about a proposed $500 million to $1 billion school bond referendum on this year’s ballot stated that “it would pay for new schools to reduce crowing and would likely raise property taxes.” The fact that the question mentioned that the bond would raise property taxes might have influenced how people responded and led them to oppose it. It is obvious that people would oppose raising taxes, and framing the question in that way could have affected the results. The survey did mention other types of taxes that could help pay for public schools, such as impact fees and a transfer tax (the state legislature would have to grant authority first), but only the school bond question mentioned property taxes. The questions dealing with how well Wake county leaders have handled growth also seem vague and do not specifically mention growth pertaining to schools. The term growth can apply to many different aspects of the county, including urban development, school, housing, and traffic. "...the dealers association poll, taken May 17-22 with an error margin of 3.7 percent, found 63 percent of people surveyed were opposed to paying more of any tax even if the new revenue would be for highway improvements. A similar number, 62percent, would be opposed to increasing the highway use tax to pay for road improvements." If anybody has any more information about this poll please let us know! I can't find a press release or a copy of the poll on the NCADA website. "Of adults surveyed, 67.6 percent support a statewide law to eliminate smoking in all public enclosed areas"
"Of nonsmokers, 94 percent support tobacco-free policies in all schools. Among smokers, support was 78.4 percent"
"the UNC Survey Research Unit conducted telephone surveys with a random statewide sample of 251 North Carolina adults and a random sample of 277 adults in Johnston County. The results of the two surveys were weighted to be representative of North Carolina adults"
Complete results of the survey can be found here (PDF). The News & Observer recently hired Rasmussen Reports to conduct a poll about Wake County's view of school taxes. Based in New Jersey, Rasmussen Reports uses an automated survey process, a process very similiar to Public Policy Polling's methodology. Rasmussen's automated polling process proves remarkably accurate. In the 2004 Presidential Election Slate magazine reported that Rasmussen's use of automated polling beat Gallup, an established nation-wide poll, in accuracy in four battleground states, Florida, Ohio, Pennsylvania, and Minnesota. As the only polling firm to predict the 2004 Presidential contenders' vote total within half of a percentage point, Rasmussen also touted predictions that were more acurate than those of both Mason-Dixon and Zogby polls. The accurate results of their predictions led Slate reporters David Kennar and William Sletan to comment that "Clearly, these automated pollsters are on to something..."
Started and President Scott Rasmussen has been conducting automated phone interviews since 1996. Last month, the Charlotte Observer released a poll showing that Charlotte-Mecklenburg supported a potential school bond proposal. That survey was conducted by MarketWise. MarketWise is a Charlotte based market research firm that started up in 1987. They provide phone surveys, research, and data analysis to businesses and other firms. They are tailored mostly to small-scale businesses in the private sector in the retail, financial, health care, and advertsing fields, but also do some government work. The company doesn't appear to be very politically involved, as most of their government based research and polling is done for civic institutions and non-profits. MarketWises's two principals are Beverly Kothe and Dr. Nancy Burnap. Neither appear to have much political or campaign experience, which helps explain why the company is geared toward the private sector adn civics rather than political candidates. … I am interested to see how they described transfer taxes. I would bet the issue of a transfer tax was not described as an alternative to higher sales or property taxes, which is the reality of the situation for many counties. Itsabadidea.org now has some of the poll results and the question wording available online. So how did they describe the transfer tax? The General Assembly is considering the creation of a new tax that would charge 1% of the sales price to the seller as a real estate transfer tax. So, if you sold a two hundred thousand dollar home, you would have to pay two thousand dollars to the state government. Would you support or oppose the establishment of a state transfer tax on real estate? That’s pretty much exactly as I predicted. The rest of the questions don’t get any better. Click here for complete results of our latest North Carolina Primary Tracking Poll. In reviewing our results from the Iowa presidential caucus survey last week, which was released today, a few things jumped out at me. The first was the large lead enjoyed by both Edwards and Romney. Both have 31% support. The fact that Edwards is ahead of both Clinton and Obama by 14 points isn’t really that surprising to me because he has virtually been camped out in Iowa for the past couple years. I don’t know how well that strategy will work for him, though. It seems as if he’s banking on winning Iowa and then gaining enough momentum to grab the public’s attention in other battleground states. The fact that 17% of Iowans are still undecided doesn’t bode well for him though. Plus there is a lot of time between now and January. We’ll see, I suppose. As for Romney, I’m also not really that surprised. His next closest challenger is Fred Thompson with just 15%. Romney has been ahead in Iowa for a while and has a well-established campaign in the state. People in Iowa really support him for some reason. The interesting thing is that he not a national frontrunner by any means. He has consistently trailed Giuliani and McCain in national polls and is not as widely recognized as either of them. Does he intend to implement a similar strategy to Edwards? I think he needs to do more to get himself known on a national stage because simply winning in Iowa probably won’t be enough. The other results are also somewhat expected. An overwhelming majority, 82%, of people responded yes when asked if the country was willing to elect a woman or minority as president. This seemed very high, especially in a state where Edwards, a white male, is way ahead, but I guess it speaks to the fact that most Democrats think Obama or Clinton are electable on a national stage. However, I do know that in races involving women and minority candidates, people tend to say they will vote for minorities at a higher rate in polls than what is actually reflected at the ballot box. It seems like some people fell bad saying they won’t support a minority, which might explain why our numbers are so high. On the Republican side it makes sense that 69% say a Mormon can be elected because Romney is leading. I’m sure that figure would not apply on a national stage, where Romney’s support is not as strong. In terms of Iraq, Democrats seem to really be fed up with the issue and want the war to end. Eighty-three percent of people said Congress should try harder to end the war, which is what they voted the Democrats into office to do. On one hand, it’s understandable that people are angry that the war continues to drag on with no end in sight. However, Congress can’t do much when President Bush continues to push the same ridiculous policies unwaveringly and threatens a veto for every bill they present. I predict that if major steps haven’t been made by fall, there will be a revolt in Congress and President Bush will be forced to change course. The Republican response was the mirror image of the Democratic one, with 73% of people saying Republicans should support Bush on Iraq and only 16% saying they should not. The majority of McCain and Giuliani supports don’t support Bush, though, and in McCain’s case twice as many don’t support Bush on Iraq as do. This is further evidence that Republicans are trying to distance themselves from Bush on Iraq because they know that supporting him is political suicide. I hope that translates into actual legislative change and not just spin. Lastly, there’s immigration. I don’t fully understand the new bill proposed last week, so I won’t pretend to. All I know is that I haven’t seen a piece of legislations that has seen such vehement opposition from both Democrats and Republicans in Congress for a long time. That opposition (and lack of understanding) is echoed in the numbers. On the Democratic side, 31% of those polled support it, 39% oppose it, and 29% don’t know. That’s a pretty even split. I think the simple fact is that the majority of people really don’t know what the bill has to offer and most Democrats don’t know what to think of it. Republican opposition to the bill is understandable, with 57% opposing and 25% supporting it. Most Republicans have always opposed a guest worker program and I don’t see that sentiment changing anytime soon. The PPP poll released today of likely South Carolina primary voters showed Obama and Fred Thompson leading their respective races. Obama received 34% of Democratic primary voters’ support and Fred Thompson received 27% of Republican primary voters’ support. The results from the poll of Democratic voters do not prove particularly surprising. Obama and Clinton are close. Edwards is hanging in there. However, the results from the Republican presidential race are more interesting to look at. As a recently-announced candidate for the Republican Presidential bid, Fred Thompson leads other major candidates by double digit margins, with Romney with 16%, McCain with 15%, and Giuliani with 14%. Some of Thompson’s 27% support may be a result of the newness of his campaign, a response of Republican primary voters’ enthusiasm to another option on the campaign trail. Thompson’s support is primarily from an older population. Only 5% of the respondents who reported to being between the ages of 18 and 29 support Thompson. Thompson, however, received the most support from the 46-60 and 60+ crowd, with 30% of the 46-60 year old respondents’ support and also 30% of the support of the respondents who reported to be over 60, perhaps, a lot of Law and Order fans. The poll released today also included a question about Iraq. Eighty-Six percent of Democrat respondents overwhelming agreed that Congress should do more to bring about an end to the war in Iraq, with only 8% of Democrat likely primary voters saying that Congress is doing a good job in its handling of the conflict. Seventy-Four percent of Republican respondents continued to declare their support for Bush’s policy in Iraq, while 21% answered that Congress should push for a change in policy. This is my first foray into the blogosphere, so I’d like to take the time to introduce myself. My name is Mark Yacoub and I’m one of the interns here at PPP for the summer. I was born and lived for 10 years just outside of Chicago in a town called Elk Grove Village. I moved to Raleigh in 1997 and have lived here ever since. I’m entering my third year at NC State in the fall (go PACK!) and I’m majoring in Political Science. I’m thinking of going to law school after college or doing public policy work. I’ve been interested in politics ever since talk began about invading Iraq (my parents were both born and lived most of their lives in Iraq; they moved to the US in 1982) and the issue hits me on a very personal level. 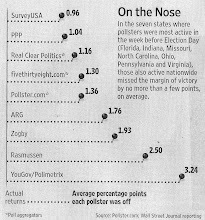 Polling has always intrigued me, and learning about the process is what attracted me to this internship. I started working with Students for Barack Obama a few months ago, which was my first time doing work for a political campaign. Although I’ve enjoyed doing it, I don’t think I could do it for a living. I’d rather work on the policy side of things. Hopefully this job will help me learn more about campaigns. I’m looking forward to the next couple months. This post will be brief, I have to go catch a plane in an hour, but make sure you see the N&O's newest poll from this morning's paper. It is a poll of Wake County residents on schools, taxes and growth issues conducted by Rasmussen (a fellow IVR pollster!). I will write some more analysis later, but my initial reaction is that these results mirror the PPP's findings a number of the same topics.